GOLD RALLIES ON FLIGHT TO SAFETY… Investors worried about soaring inflation spurred by the bailouts of AIG, Fannie May and Freddie Mac pushed gold up to $878 an ounce. The Federal Reserve in the US is leading the rescue party. An increase in the money supply causes general price levels to rise. Gold is a hedge against such price increases. Also, the Chinese newspaper The China Daily carried an editorial urging diversification out of US$. The buying stampede in gold, known as a “hard” currency, resulted in the largest one-day increase since 1979. OIL RALLYING AFTER 50% RETRACEMENT… After a massive move in oil to a record $150 a barrel, the July to September correction took prices back near $91. This coincided with an OPEC statement suggesting $90-$95 Oil was acceptable. 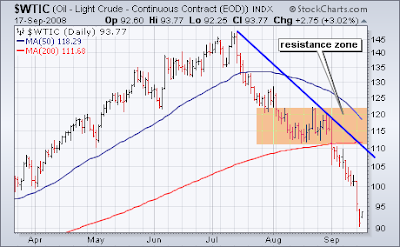 Now I’m looking for oil to rally back to the declining blue trendline around $107-108. VIX HITS HIGHEST LEVEL IN YEARS… The market’s “fear” gauge hit levels previously seen only at short-term bottoms in the stock market. Generally, spikes to extreme levels are followed by short-term rallies. Yesterday’s panic selling in US financial stocks may have been one such time. Once the fear starts to subside (as it is today – highlighted in yellow) it usually results in a market rally. BLACK SWAN…. Naseem Taleb’s new book is entitled “Black Swans”. It depicts the role of chance in life and in the financial markets. Last week the SEC changed the rules on “naked shorting”. This has been one of Wall Street’s dirty little secrets for years, now illuminated by the SEC’s revelations. This was an arrow aimed squarely at the short-sellers of the bank stocks in the US. These people would sell the shares of the banks without owning them, hoping to buy them back at lower prices and thus reap a profit. The SEC essentially dropped a “match” on a very over-sold “gasoline” type situation. The result was the US Financial sector rose 13% by the close of the market on Thursday — a Black Swan. Rarely seen, this event was a 11 standard deviation event. To put this in perspective, a four standard deviation event is supposed to happen once every 31,000 years. (On a bigger scale this is exactly why I have a problem with Modern Portfolio Theory and CAPM….but that is for another day). Major turns in the market are normally marked by such events. I am not turning bullish completely on US bank stocks, however, my bullish antennae are raised. COMMODITY PRICES FALL… DB Commodities Tracking Index (DBC) which represents a basket of commodities (including crude oil, heating oil, gold, aluminum, corn, and wheat). 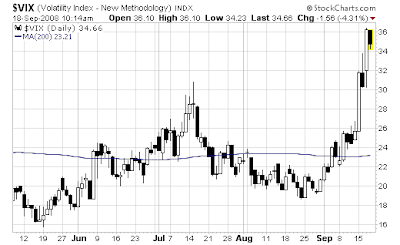 Chart 2 shows it having broken its 50-day moving average. Another reader asked if the downturn included agricultural markets. 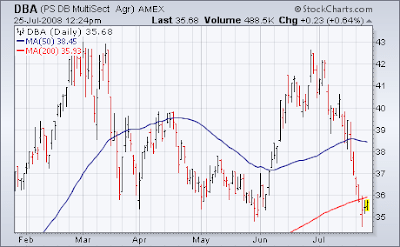 Chart 3 shows the DB Agricultural ETF (DBA) already threatening its 200-day average after failing a retest of its March high. Better weather conditions in the Midwest have caused profit-taking in grain markets [DBA includes corn, wheat, soybeans, and sugar]. 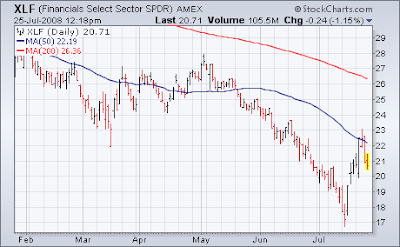 ENERGY STOCKS DECLINE… As I wrote in my June 4th and June 17th Market Letters, oil prices and energy stocks were due for a pullback. The momentum indicators flashed SELL a the new high in oil, as they did not follow suit. 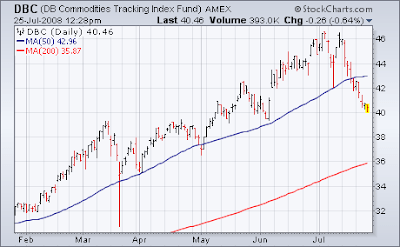 Support should come in around this level at the 200d Moving Average. Moreover, even if oil prices drop to $100 and gas drops to $8, this level represents good value. 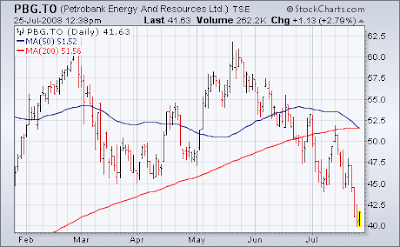 One stock of note is Petrobank Energy and Resources. At $93 oil, the company will cash flow $640M next year on it’s Bakken property alone. The stock has become a darling of the mutual fund arena and is severely oversold. A bounce back to $50 is not out of the question. 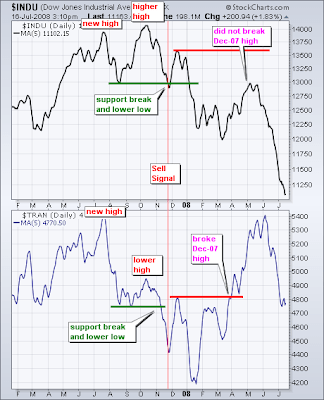 DOW THEORY SELL SIGNAL IS STILL VALID… According to Dow Theory, the Dow Industrials and Dow Transports can give buy and sell signals if they act in unison. Recall I’ve equated this to watching the tide on two shores of the same body of water. Chart 5 shows how the Transports stubbornly refused to make a new lower low when the Industrials broke down from their May high and made a new low. 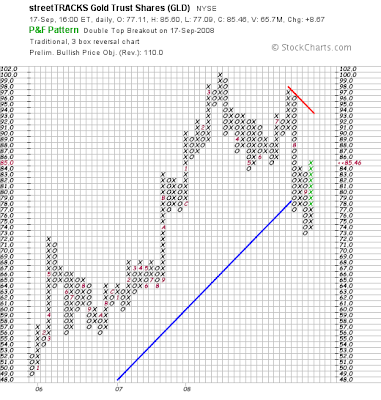 The Dow subsequently moved to new lows for the year and the Dow Theory sell signal remains in place. The Dow Transports must move above its June 2008 high and the Dow Industrials must move above its May 2008 high to trigger a Dow Theory buy signal.